…to “A Very Farmhouse Christmas Tour”. We are so happy you are here. I want to begin by thanking our sweet host, Christina of Christina’s Adventures. If you have just arrived from Angie, Postcards From the Ridge, a special welcome. I’m sure you enjoyed her incredible style. She is so wonderfully creative I always get great ideas from her!! 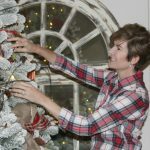 At the end of this tour you’ll find a list of all our talented and inspiring participants in our farmhouse inspired Christmas home tour and links to continue on to the next home. There’s no better time of year to decorate than at Christmas time. Even before I became a decorator and lived, breathed, dreamed decor, I would “rev up” and put forth my best efforts for the holidays. Let’s just say it’s a BIG DEAL. I have hosted my extended family for Christmas for the past 15 years, so I have had a bit of practice. I pride myself on never creating the same display twice. Every year, even if I am working with basically the same decor elements I create something fresh and new by mixing it all up. Whether you have a big budget or a non-existent one, I know one thing for sure. You can create MAGIC by simply using your creativity! That’s why time spent getting inspired is so worthwhile…it’s like “money in the bank”! I hope this tour gives you some new ideas and inspires you to step outside your “tried and true” decorating. Your surroundings should add joy to all your holiday celebrations. I hope this tour motivates your own holiday decorating. 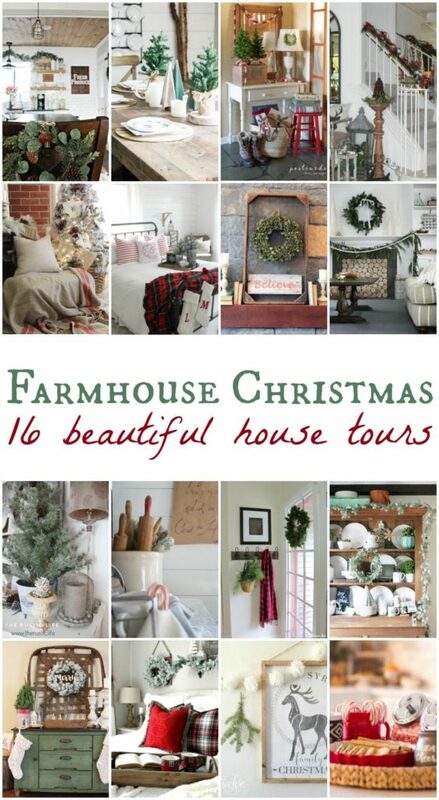 Let’s start my Farmhouse Christmas Tour! As you step through the double doors you enter a wide hallway that I like to decorate in vignettes. 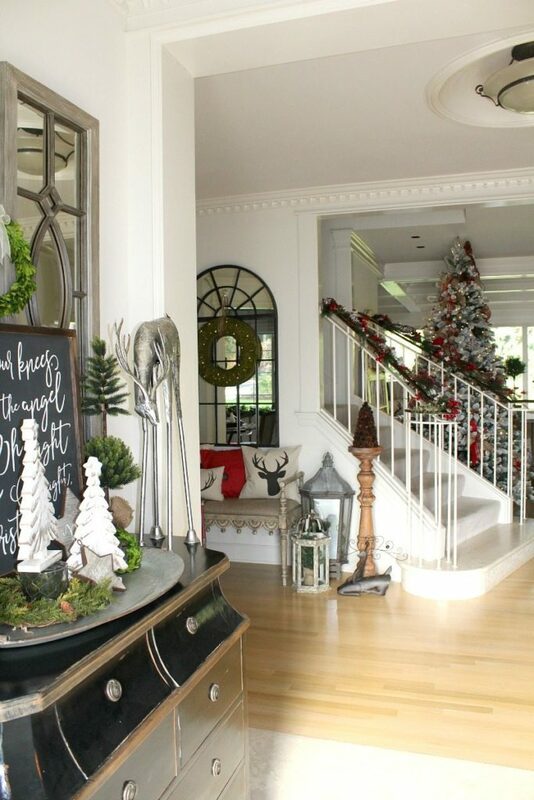 You can see the tree just beyond the staircase inviting guests to join us in celebrating the season. 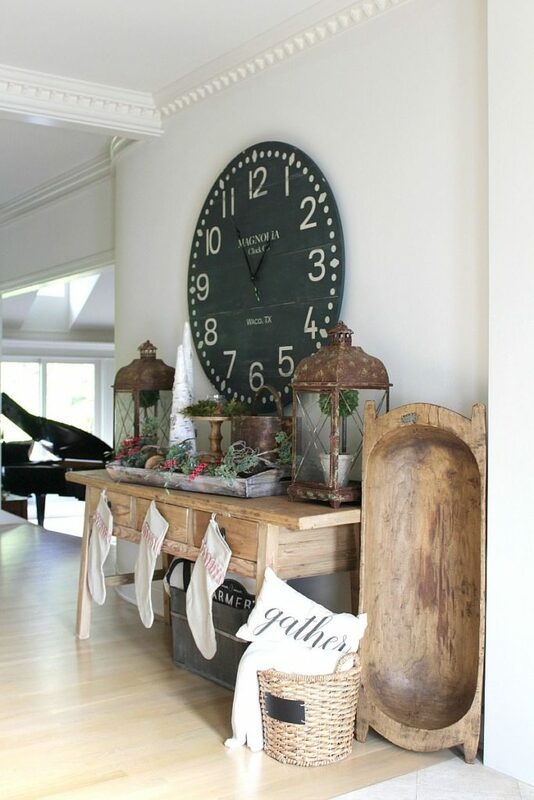 Lots of fun farmhouse Christmas touches create a warm, rustic feel amidst the more classic details of our home. The casual farmhouse ambiance says relax and stay awhile. I really have so much fun decorating this front entrance chest. I began with this special farmhouse Christmas sign from Denise @deveniedesigns that is my favorite Christmas song, “Fall on Your Knees…” Honestly I might not be able to put this away after the holidays. I find myself singing it all the time now! I used this rustic farmhouse galvanized oval tray and wooden trees, adding some holiday stars, and finished it off with white glitter pine cones for a bit of sparkle. Next, evergreen/boxwood items add a pop of color and give it an organic feel. Symmetry was created adding two evergreen topiaries and two similar (but not matching) metal deer. Aren’t they cool? Let’s move into the heart of the home, our family room. A wall of glass sliding doors allows plenty of light and a beautiful year-round evergreen view of our golf course. This view influences my desire to bring the natural feel indoors. 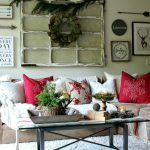 Therefore, I chose to decorate the family room with traditional reds, holidays evergreen, magnolia, and elements of farmhouse and rustic decor. 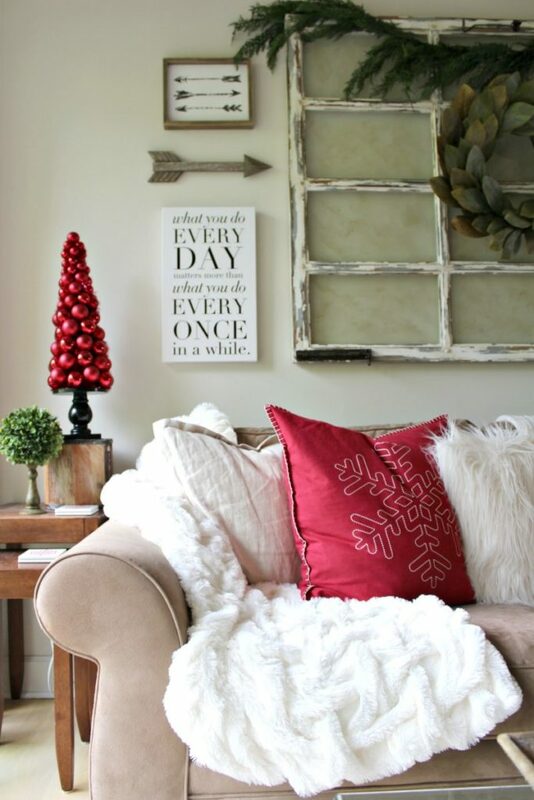 Fur pillows mix with bright red ones to add a punch of color against the sea of neutrality. 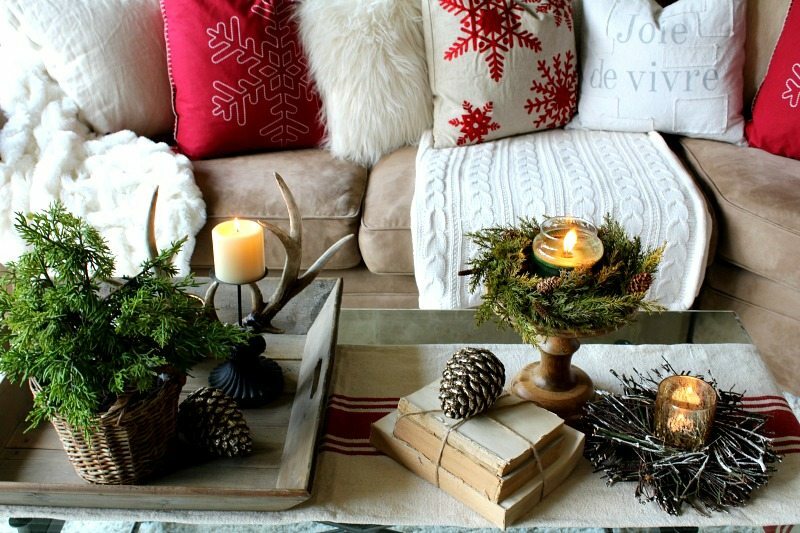 My Pottery Barn Cable Knit Throw and Luxurious Faux Fur Throw add a cozy winter feel to this family gathering spot. 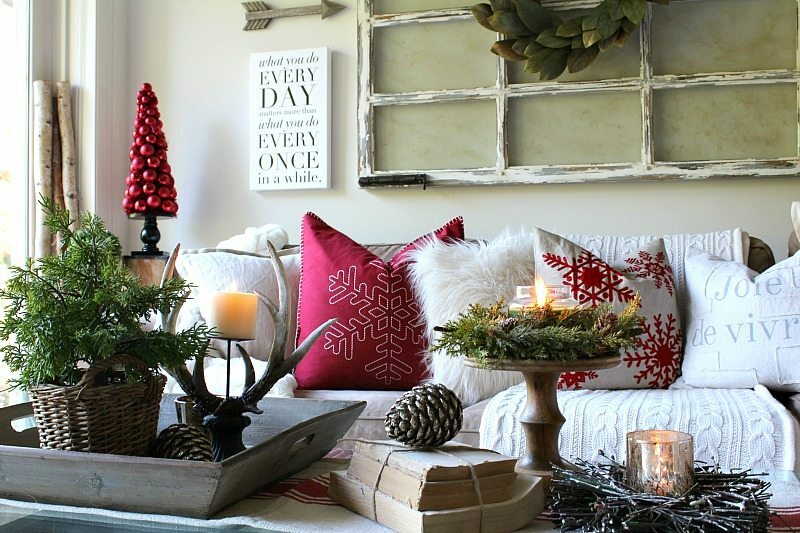 Farmhouse elements mix with cozy Christmas reds, whites and evergreens to create a welcome and relaxed holiday vibe. 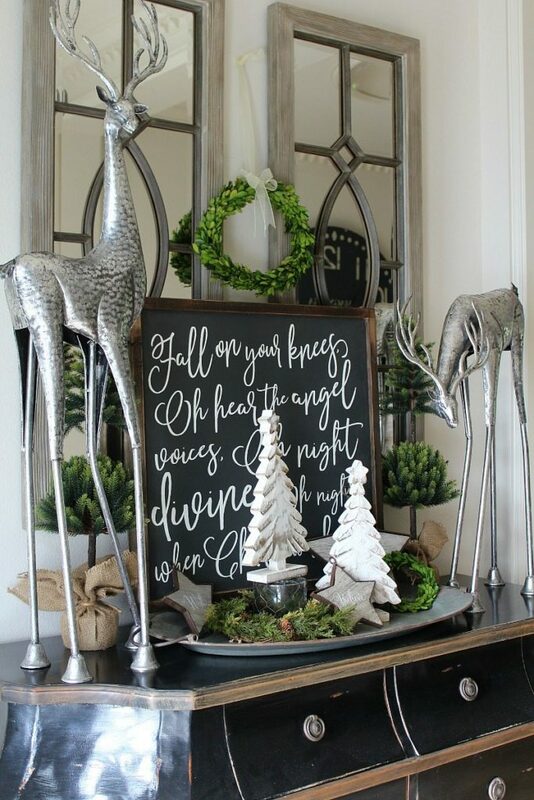 Rustic elements add warmth and a country cabin feel: an antler candle holder, a rustic twig nest, evergreen accents, pine cones and candles. 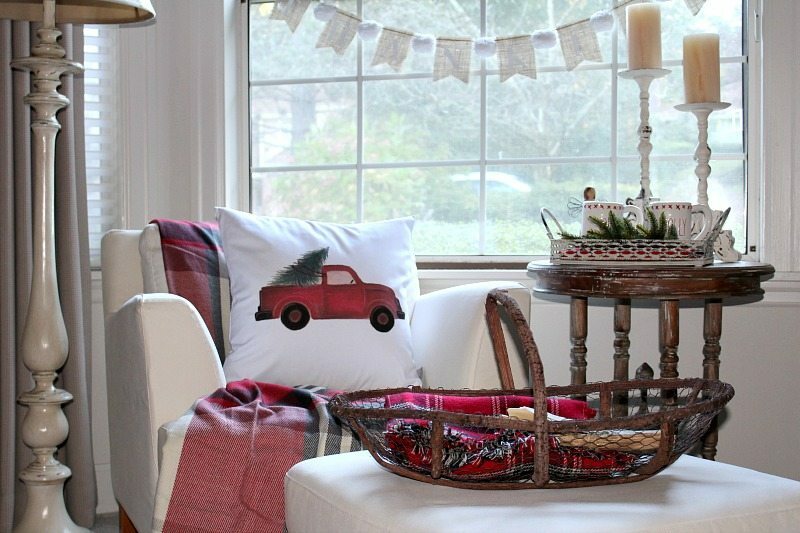 A farmhouse mood is achieved using a Reclaimed Wood Tray, farmhouse red-stripe cotton runner, rustic basket, and old books tied in string. Want all the details on how I put this coffee table together? I share a step by step tutorial to create a masterful coffee table for any season or occasion. Click Here to read. 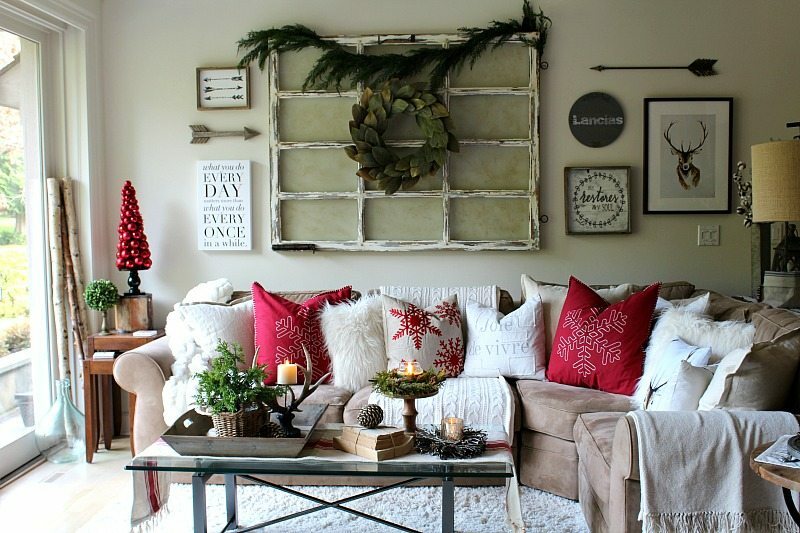 Pops of red and green peek out of the neutral decor to add the right touch of holiday without overwhelming the relaxed feel of this family room. Lit candles and a mix of surprising textures add finishing touches to this coffee table display. All my choices here are meant to invite everyone to settle in and get comfortable. Lots of pillows provide comfort, not just cute decor. Three different throws punctuate the large, wrapping sectional, so everyone gets their own. Since this is the main TV watching venue I’m always careful to not put anything too tall on the coffee table. Plenty of candles are lit all around that add to the cozy, as well as aromatic atmosphere. Does anyone else play the game of “furniture scramble” when the Christmas tree displaces furniture? This happened this year. I like the changes so much I might keep them. This is one area where both the chair and table had to move to make way for the tree. 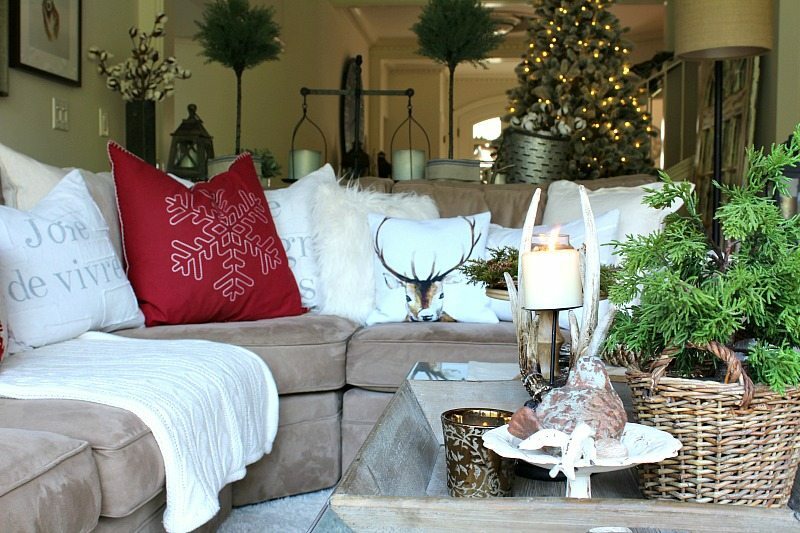 In addition to their new home in the family room I updated their look with Christmas details. Shop the look with similar items at the end of this post or click here to go to our SHOP . There is nothing better when the weather gets nippy than cozying up next to a warm fireplace with your favorite book and a soft fur throw. Confession time! This is the very first year I’ve EVER decorated my master bedroom. I’m not sure why. I’m especially surprised since now I realize how easy it is! 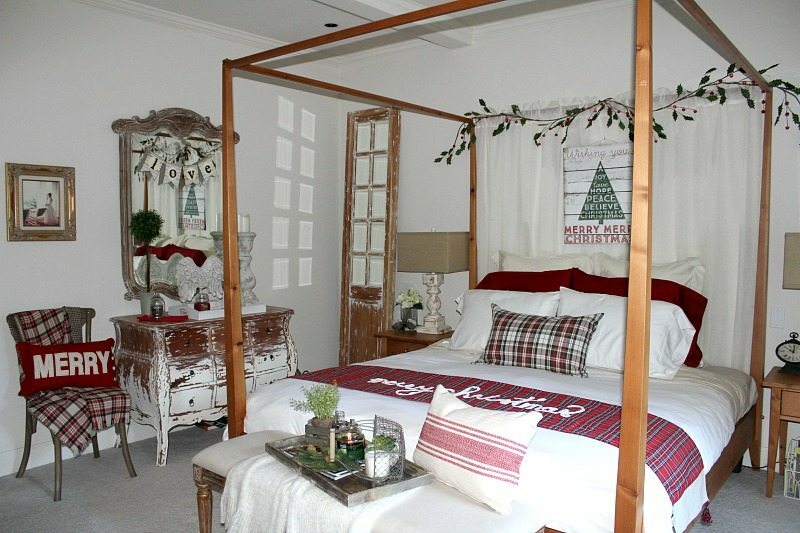 In addition, I’m probably enjoying my master bedroom holiday decor more than any other room. When you see how easy it is you might be motivated to do a little holiday makeover in your room too. I began with new white bedding. 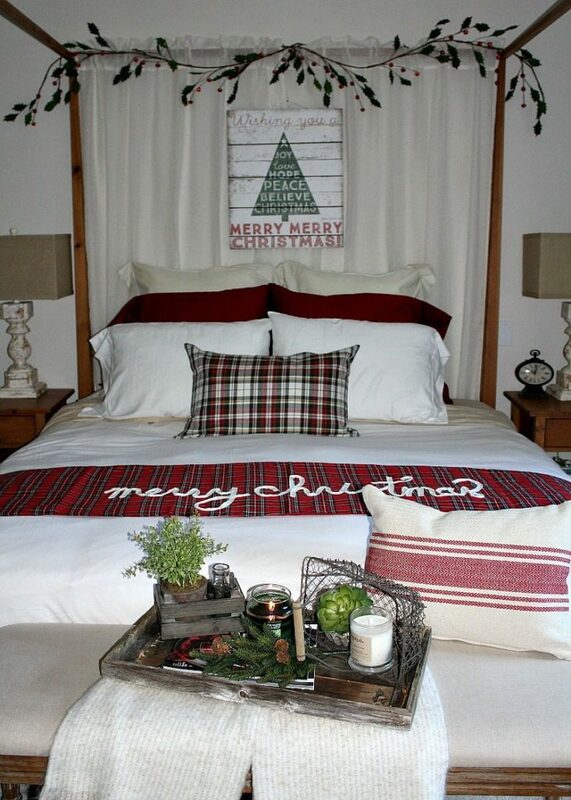 The center pillow is from Pottery Barn and is the Denver Plaid. The deep red pillows in back are from Target and are regular size pillow cases (that I propped up so they would look bigger). 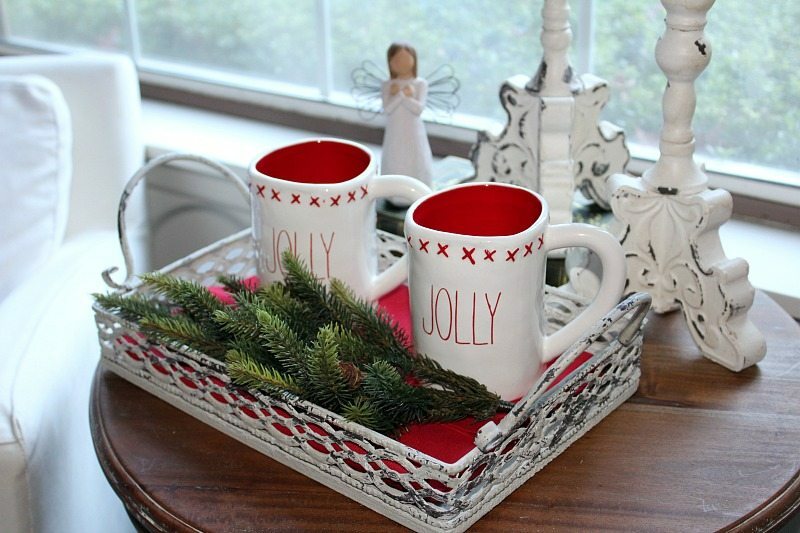 The Merry Christmas “throw” is actually a table runner from a company called Mud Pie. 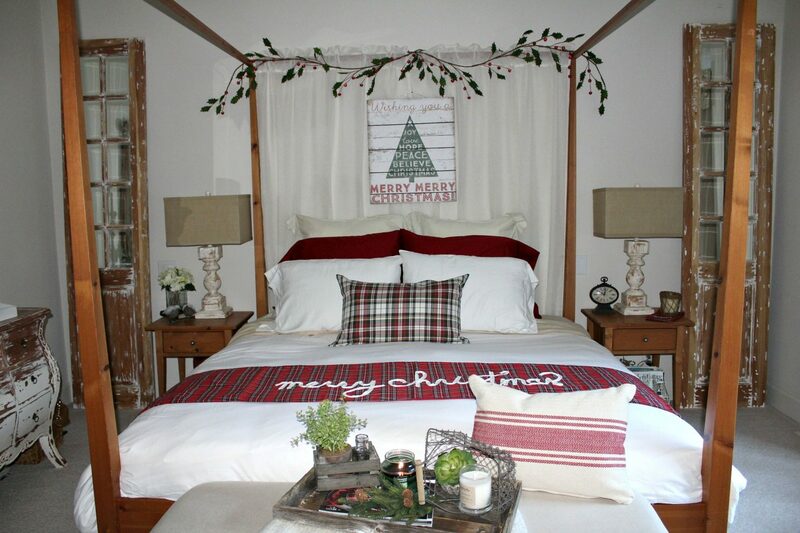 Framing the four poster pencil bed is some faux garland strands of red bells and holly. Finally, hung in front of the creamy linen curtains is a rustic hand painted wood sign “Wishing you a merry, merry Christmas”. I swapped out my usual elegant gold tray on the bench for this reclaimed wood one to add the perfect rustic country touch. I left room on either side because my husband likes to have a place to sit to put on his socks. When my decor functions as well as looks good the result is a happy home. 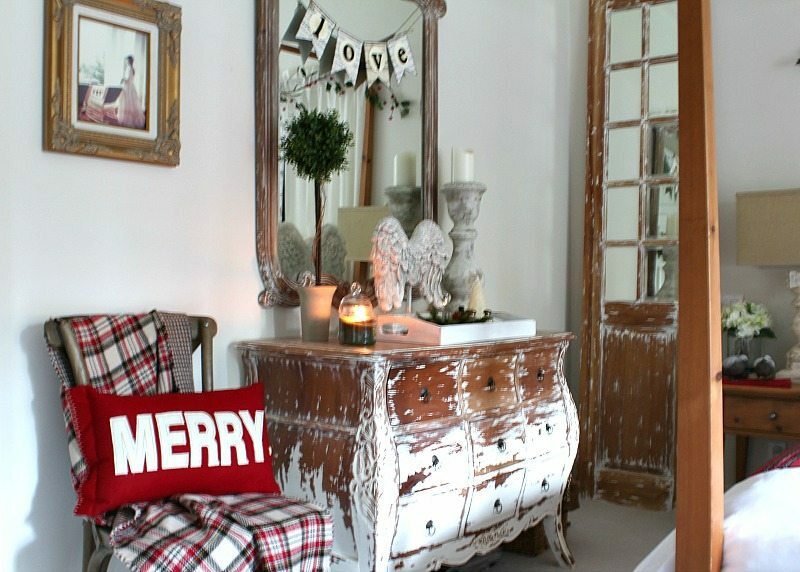 My day to day neutral decor is the perfect backdrop for some pops of merry red and tartan. 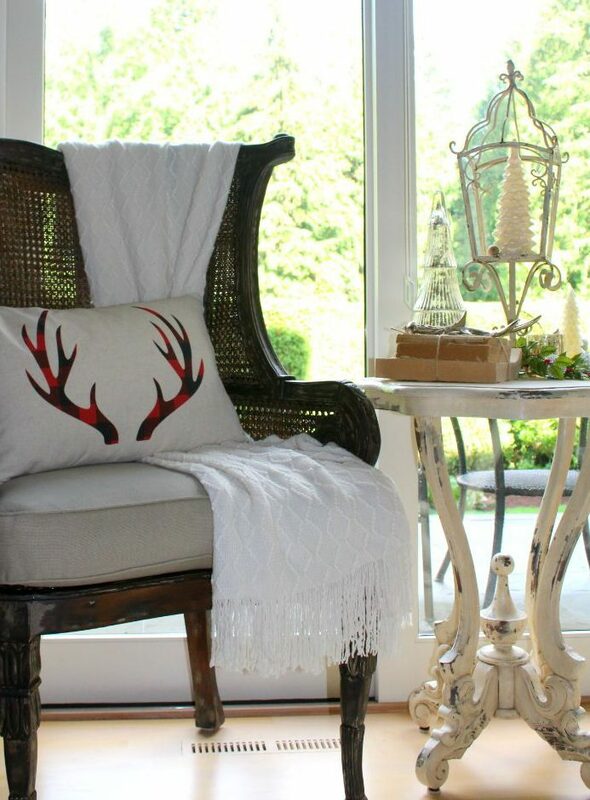 My farmhouse side chair gets a makeover by trading out its usual creamy throw for a gorgeous tartan throw (that doubles as a scarf or shawl) and a bright Merry Pillow from Target. On the bedroom side table a pair of winter doves, a faux evergreen bough and a pine Christmas candle add a soft holiday update. A red buffalo plaid pillow peaks out from below. The look is understated country charm. The angel wings look quite on point for Christmas, even though they stay year round. A new boxwood topiary adds a bit of holiday green to the otherwise neutral vignette. This year I have a new artificial Christmas tree from King of Christmas. I’ve owned artificial trees since the 1990’s, but I’ve never had a tree of this quality. This is the “King” tree of theirs. It is 9 feet tall, is beautifully flocked, and comes pre-lit. It is my first flocked tree, and I always worried that the flocking would make a mess. So far, there is no mess. 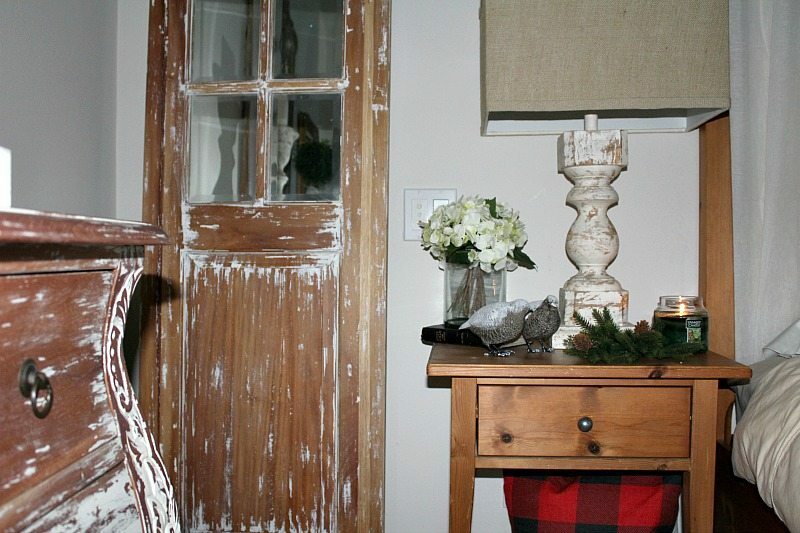 I love how easy it was to incorporate my Farmhouse Christmas theme using this flocked look. I think it would look equally beautiful if you were going for glam or almost any theme. No wonder flocking seems to be so “in” right now. It is magical! For all the details on how I decorated this tree, including step-by-step instructions for how to make these bows head over to my post Easy Christmas Tree Decorating Tips. If you are anything like me part of you really enjoys seeing all the creativity. When I look at other people’s homes (whether it’s in person, on a blog, or in a magazine) I get very inspired and excited to go home and work my own “magic”. Another part of me gets slightly overwhelmed, even discouraged. It’s the “grass is always greener” mentality or just a bit of insecurity that can set it. I want to offer my advice in this department. It is my hope that you will take inspiration but not feel pressure from it. ( I’m right there with you honestly trying to take my own advice!) Especially during the holidays when our to do lists seem never ending I hope my tour and the others you look at will add to your joy and excitement without adding stress. With my blogging and Instagram responsibilities compounding my list of obligations this year I decided to focus my efforts on certain areas of my home. 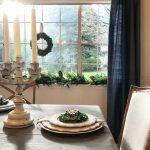 Before I began decorating I decided which areas of my home to focus on and which areas to skip. You can do this too. This is a no-guilt, “smart” solution to holiday decorating that I highly recommend. Because my family is spending the holidays at my sister Jodie’s I chose to do just one tree and skip my outdoor lights. I also “skipped” the entire 2nd level of my home. This allowed me to focus my efforts better and really helped my stress level. Limiting my task list helps me enjoy the process. When this mama is less stressed the whole family feels less stress. I know it is the same in most households. For more strategies on how to manage stress read my recent blog post devoted to this all-important topic, Avoid Holiday Stress: 5 Strategies. Being proactive in managing potential stress is a great way to have more time, energy, and JOY during the holidays. So, pick and choose your priorities, My Friends, and enjoy! After all, this time of year should be focused on traditions, family, and celebrating the birth of Our Savior. From Jodie and me, we wish you a Blessed, Peaceful and Joyous Holiday Season! 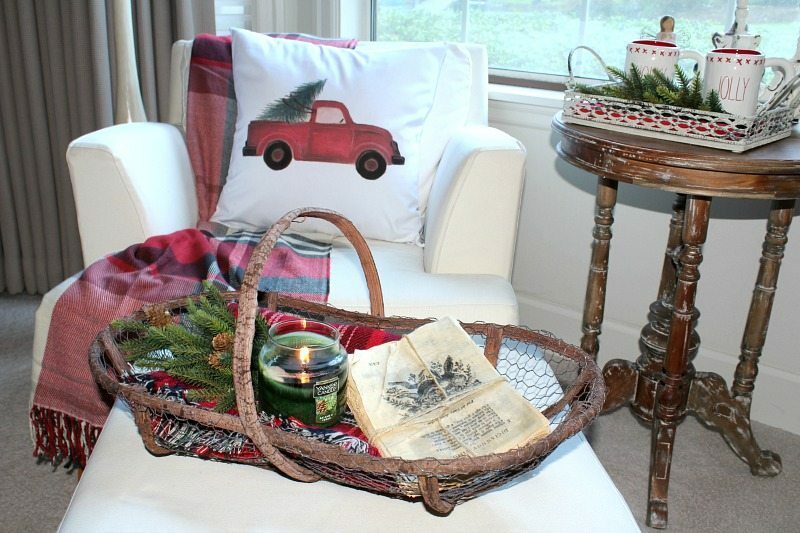 Enjoy our Farmhouse Christmas blog Tour for all your holiday decorating inspiration! Now that you’ve seen my house, continue on to my dear friend Christina of Christina’s Adventures to see her beautiful Christmas house tour! Everything is so festive and beautiful!! Hope you have a Merry Christmas! Your home is just stunning as always! I love every inch of your beautiful spaces you’ve decorated – but I also truly love the wisdom you shared at the end of the post. 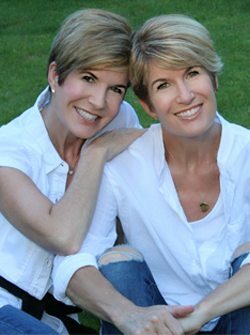 Thank you so much for sharing our home! AHH JULIE – this all looks incredible!!! I am pinning literally everything! So many great ideas!!! Your home looks beautiful friend! Everything looks effortlessly beautiful! 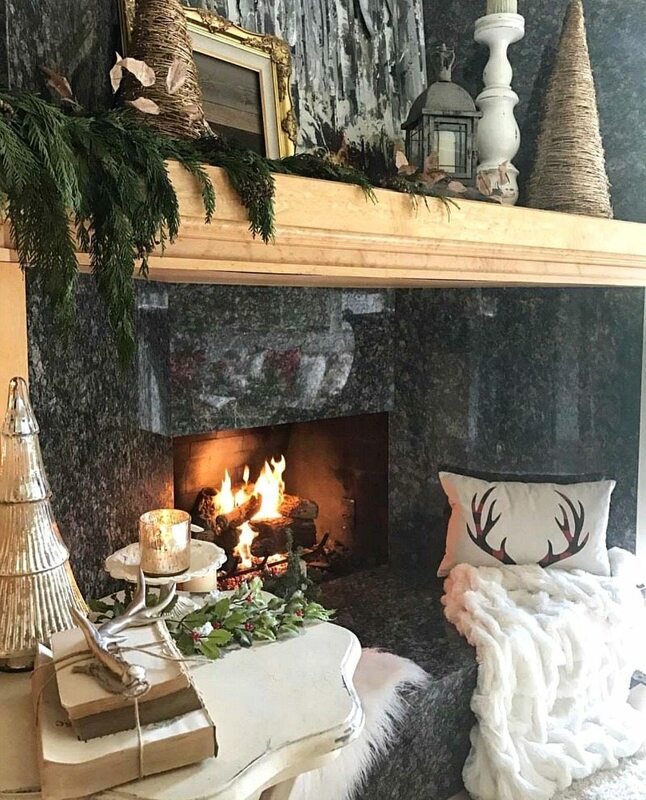 Your home is already so pretty the Christmas decor makes it that much more charming ❤️?❤️️ P.
I love your family room. The light is soooo nice for a family room. Our family room has great natural light, too. It just draws us into that space! The pillows, blankets and rustic texture feels so warm and inviting. Every little detail in both of your homes is spot on! I looked these pictures over and over – getting ideas for my home! Wow! 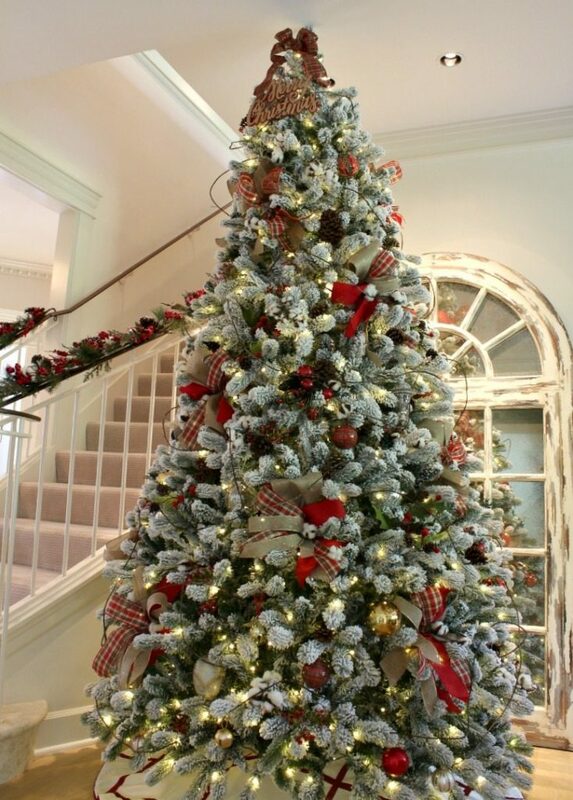 Thank you for sharing your beautiful Christmas home tour with all of us! Thank you for taking the time to visit and to leave such a heartfelt sweet comment! We both appreciate your words and your enthusiasm! It’s all so inviting. I’m such pillow addict I’m in love with all yours. We have similar lanterns and I adore yours. Well done!!! Wow, what a gorgeous home! That tree in the entrance is WOW! Love it all! Your home is just stunning! It’s so inspiring and I LOVE every detail! I hope you have a very Merry Christmas! What a beautiful farmhouse tour Julie! Your family room looks incredibly cozy and I love your Christmas tree!!! Merry Christmas!!! Gah! I love the placement of your dough bowl! And, umm, furniture scramble is so real in my home. I am still moving things around. I love to do it though, it allows some deep cleaning, and freshening up! I love all of it! A beautiful display of a perfect winter wonderland!!! I know it’s a long while before Christmas, but I really do think I’ve read every post and some twice ???? Not only did I read the Christmas tour, but your fall tour as well???????? I love the harvest centerpiece! I believe it could be used year round and it has inspired me to do something similar! Great blog on home decorating lists. It was very informative for me thanks for sharing this amazing article with us. 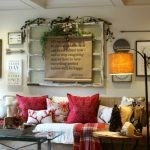 Awesome blogs for home decoration ideas, I loved to read this blog and ideas, Thanks for sharing us. Keep posting like this! This is amazing and so well put. I’ve been diving into learning how to decorate my house, and realize that I’ve never really thought about it very much! Those ideas are very useful! Love to read this article, It’s great 🙂 thank you so much for sharing this post. Wow, decent information is here. I am very happy with your work. blog. My first time visit. Happy Holidays and thanks for your beautiful photos and ideas.